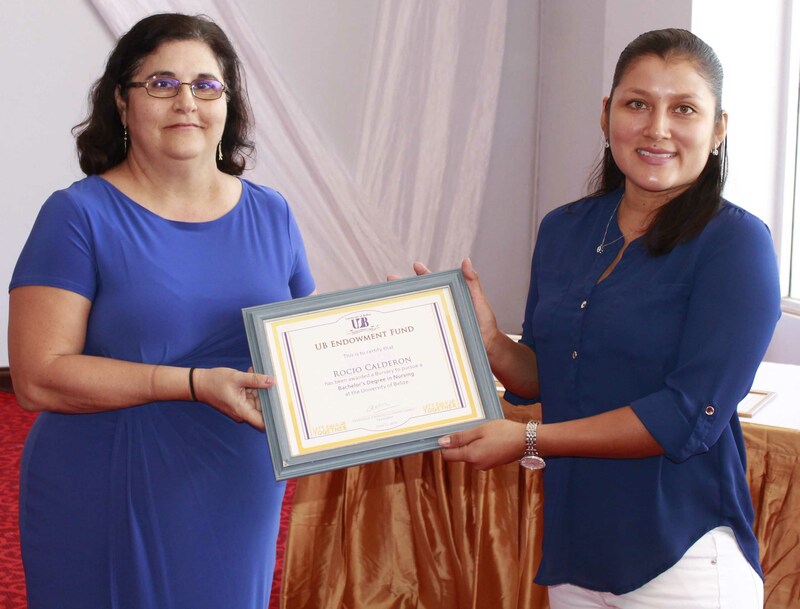 In 2017 the University of Belize established an Endowment Fund (UBDEF) that would allow the institution to improve services and support to its students, to better prepare itself as a true catalyst of change and to foster national development. The 1st Presidential All-Inclusive Fete held on September 17, 2017 would be the source of funds for this endowment. The profits from that event was used to support the cost of giving scholarships and other financial aid to needy students from all parts of Belize to attend UB in the form of bursaries. As a result, five bursaries were awarded to deserving students on June 21, 2018. The students were selected based on financial need and academic excellence. The UBDEF is aiming to assist more students and provide them with access to an education. The bursary is tenable for one academic year excluding the Summer Semester but will be reviewed on a semester-by-semester basis. The bursary covers tuition only for twelve (12) credits per semester. 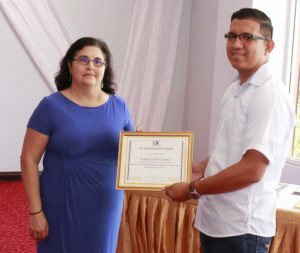 One of the main reasons for the bursaries is to assist the students in pursuing their current Bachelor degrees which will impact the development of Belize. The vision for this fund was the brainchild of the President of the University of Belize, Professor Emeritus Clement Sankat. President Sankat feels that the UBDEF is a way for the University of Belize and the private sector as well as the general public of Belize to contribute to the development of the nation and achieve a positive impact on the society. • Delroy Coc, a child of the South, who is a hardworking, family oriented individual whose goal is to better the living conditions of his family. Delroy was awarded a bursary that he will utilize in order to pursue his Bachelor’s Degree in Information Technology. 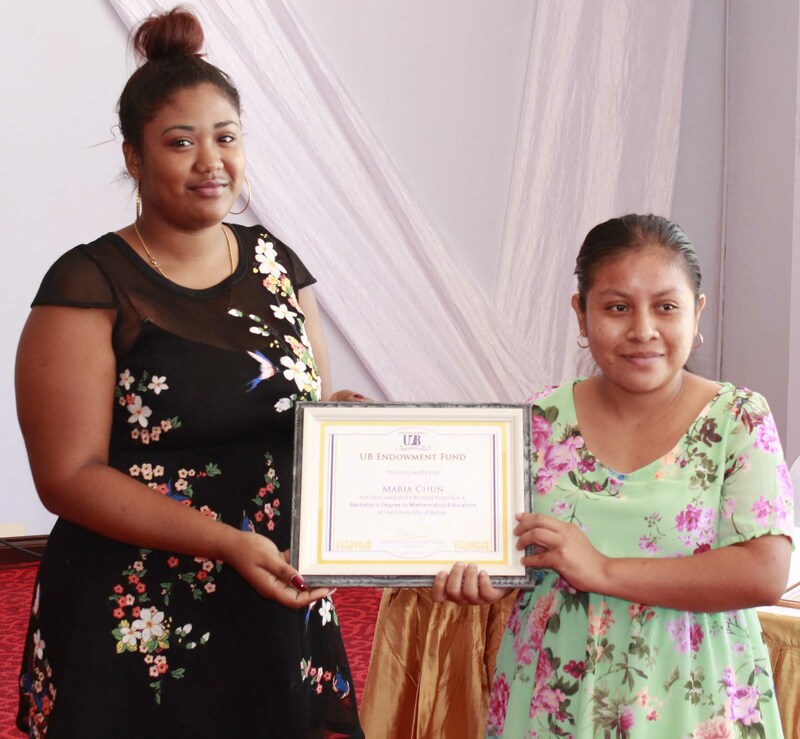 •Aspiring Paediatric Nurse Rocio Calderon of Rural Belize, whose challenges never kept her down and is currently pursing a Bachelor’s Degree in Nursing. She would like to further her studies by getting her PHD. in Nursing. • Maria Chun is grateful for the opportunity that this award will provide her since she has to rely on financial aid or grants to help finance her education. She is happy that she received this award because it will reduce her financial burdens and provide assistance for her to continue pursuing her education, which will place her one step closer to the goals she wants to achieve. Maria is the eldest of four, she believes that by becoming a teacher she can contribute to Belize’s Development. Even though financial burdens are everywhere Maria is grateful for the assistance that is being given to her because she will be able to achieve her goal in becoming a teacher. Maria is feeding her passion for Math by pursuing a Bachelor’s Degree in Mathematics Education. 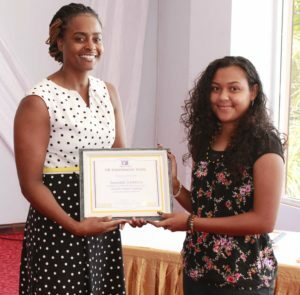 •Zamarie Griffith from Belmopan is determined to achieve her goal despite the heartache of losing her father and transitioning into a single mother household. Zamarie is pursuing a Bachelor’s Degree in Biology. She is aspiring to be an Environmental Scientist in order to take part in research to find solutions to current environmental issues Belize is currently facing. •“I am as strong as I need to be.” Roberto Melendez from Bullet Tree Falls proves that no matter the challenges he comes across in life he will achieve his goal even if it means making sacrifices that will challenge him or a sickness that will attempt to keep him down. Roberto Melendez is pursuing a Bachelor’s Degree in Medical Laboratory Technology. 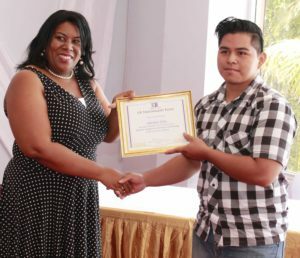 The University of Belize congratulates these students for their hard work and determination and is grateful for the support garnered from the Belizeans People to making this Endowment Fund a success. The 2nd President’s All Inclusive Fete will be held on September 1, 2018 at the Ramada Princess Hotel and Casino beginning at 9:00 p.m. The lead performer will be Pluto Shervington from Jamaica. Oscar B from Trinidad and Tobago will also be present this year along with ELJAI who is a Belizean artist. The accompanying bands will be Gilharry 7 and the Youth Connection Band. You can also make pledges or contribution to the UB Development Endowment Fund. For those who are interested in attending the fete and contributing to the Endowment Fund, arrangements can be made by contacting the Office of the President at 822-1000 extension 193. Be a part of the fun and support the 2nd President’s All Inclusive Fete on September 1, 2018.